We're looking at a long, nearly straight, almost totally traffic-free downhill. We'd climbed up to the base of the Palm Springs to Idyllwild Ariel Tramway. Our goal was to see how fast Mitsubishi's tiny i could go. We're on the gas, and the teensy, turbocharged 660cc three-banger is giving us all its got. The speedometer ticks upwards, now cresting 100. In front of us is nothing but inviting tarmac. Deeper and harder we push and the numbers keep ticking up. 119, 120, 121 and then finally hitting 122. We felt we left a little on the table and could have probably achieved a terminal velocity of around 130. Maybe. 125 for sure. Before you crime and punishment types climb upon your soapboxes, we should mention that the right-hand drive, JDM-only i reads out in kilometers per hour. Meaning that our top speed was almost 76 mph. And we stand by our assertion that we totally could have hit 80 mph. Photos by Drew Phillips / Copyright (C)2009 Weblogs, Inc.
Quick Spin: Mitsubishi i is a good car with a bad name originally appeared on Autoblog Green on Tue, 15 Dec 2009 11:56:00 EST. Please see our terms for use of feeds. 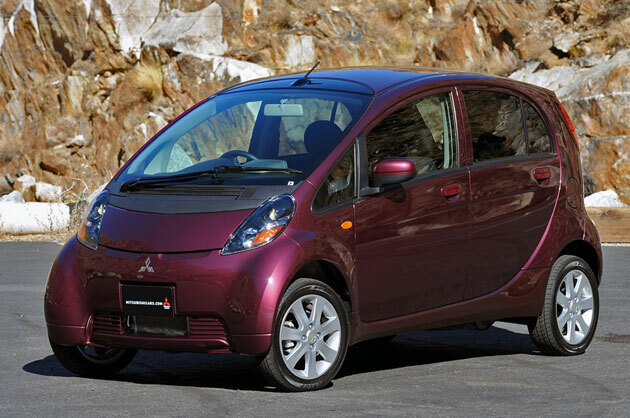 0 comments on "Quick Spin: Mitsubishi i is a good car with a bad name"